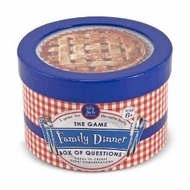 Join in the fun with the most popular dinner conversation game ever! As seen on The Real Housewives of New Jersey; The Family Dinner Box of Questions is the perfect choice for your next family gathering! Bond with your loved ones and get to know each other better than ever before! Dinner will be even more appetizing when everyone is engaged in this fun, family-friendly question activity!